The artist Evacustes A. Phipson was born at King's Norton near Birmingham on 9th February 1854. He was christened Edward Arthur Phipson but changed his first name to Evacustes (a Greek word meaning 'ready listener').He lost a fortune on a scheme in Australia and returned to England in about 1889 when he made his living by selling his paintings. 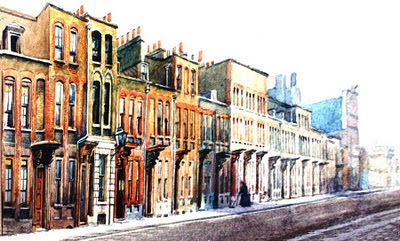 He lived in various parts of Britain and painted in many places. Shrewsbury Museums Service has 13 pictures that he painted in Shrewsbury and several of these are illustrated on the Darwin Country website. He died in 1931 at Rye in Sussex.